Officers from South Gloucestershire Council Trading Standards have donated items of clothing recovered during raids to His Church charity which will be recycled and put to good use. Senior Fair Trade Officer Neil Derrick is pictured handing over the garments to His Church charity worker Sarah Wayment. More than 60 items of counterfeit clothing including hooded tops, sweatshirts and t-shirts will now have the false labels removed and replaced with the charity’s logo. They are then donated to homeless charities or shelters to benefit some of society’s most vulnerable people. 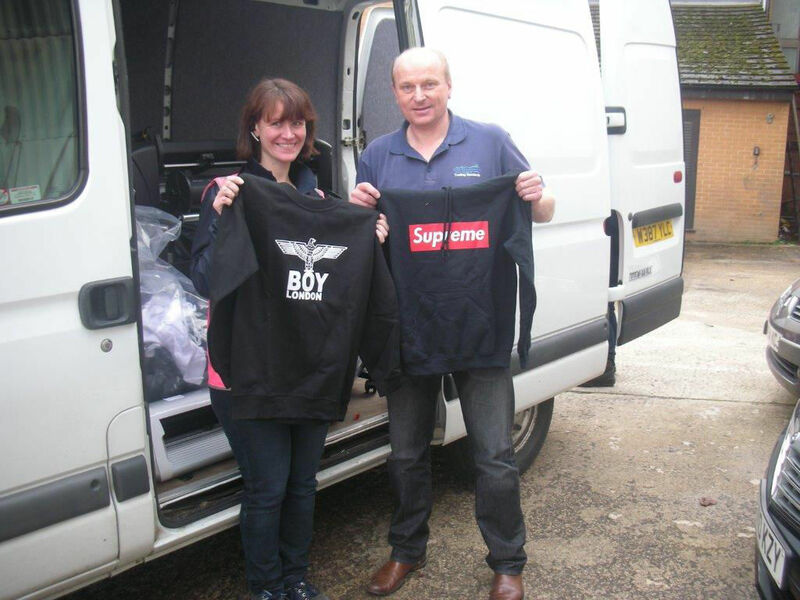 As well as the clothing, officers also presented the Lincolnshire-based charity with a printing press and printing equipment used to produce the counterfeit clothing which was also seized during one of the raids. The charity will use this to help rebrand the garments. The contributions from Trading Standards teams across the country benefit around 250 homeless centres and women’s shelters.